Block Copolymer Surfactant Mixtures in Aqueous Solution: Can we Achieve Size and Shape Control by Co-Micellization? 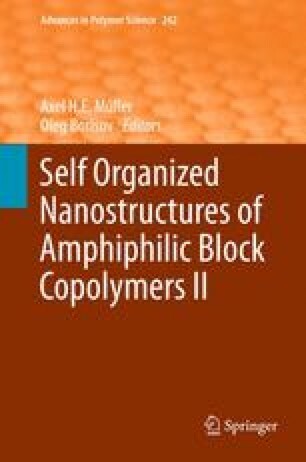 Amphiphilic block copolymers (BCPs) are used in a steadily growing number of applications and formulations such as cosmetics, detergents, coatings, and enhanced oil recovery. In most of these applications, BCPs are used in complex mixtures with normal surfactants to control the solution properties of the mentioned systems. In addition, these systems are used as templates for nanoparticle and mesoporous silica synthesis. Hence, a deeper understanding of the self-assembly processes and the formed structures is desirable to achieve a better control of the properties of the obtained inorganic materials. This article reviews the recent literature describing physicochemical aspects of the BCP/surfactant mixtures and attempts to identify some general features of the behavior of these systems. The author wishes to thank H. von Berlepsch for the Cryo-TEM image. The presented experiments were funded by the Deutsche Forschungsgemeinschaft (Sfb 481/TP A15). In addition financial support from the Marie-Curie RTN “POLYAMPHI” is gratefully acknowledged.